If you've been looking for the ultimate do-anything saw, you've found it! The Precision 2000 Bandsaw is driven by a powerful, yet quiet 1/8 hp motor that will make cutting nearly any material a breeze. 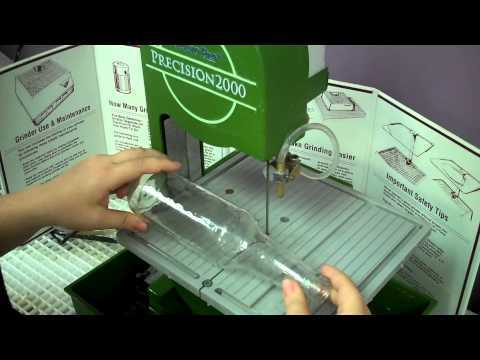 Equipped with a pre-installed Studio Pro Diamond blade for glass, tile, acrylics, and lexan plastics, you can set up and start cutting in minutes. Switch to the included Studio Pro Wood blade easily with the spring tension mounting system for blades and you're ready to tackle cuts on wood and composites. This sturdy little saw features a rust-free aluminum frame and plastic body, making it virtually maintenance-free, perfect for the occasional user, hobbyist or weekend warrior. A small footprint and lightweight design offer portability and make it easy to set up and use even in small spaces, all without sacrificing precision and quality. Backed by a full 3 year manufacturer warranty (excluding blades). Diamond Tech Tip: Control your cutting speed with a Rheostat (sold separately).